A clear night sky is a sight to behold. Especially if you know what you are looking at up there besides the moon. 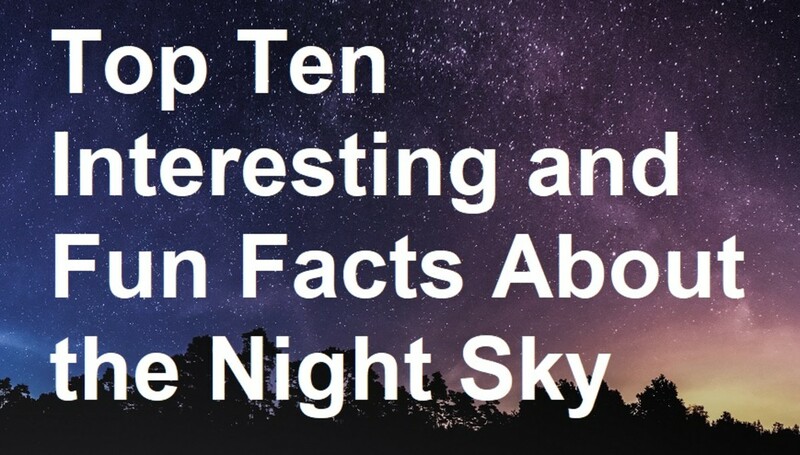 Without the aid of an expensive, programmed telescope or sophisticated computer software, you can discover a lot about the night sky by knowing the name of some of the most prominent stars, constellations, and even some galaxies. 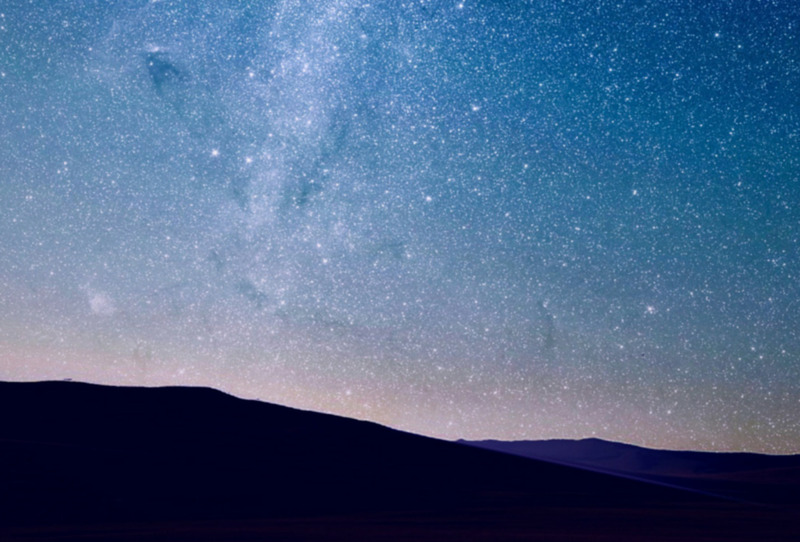 Astronomers usually start from one or more stars as reference points to determine the locations of all these celestial objects in the night sky. These reference points are called guide stars on star charts or wide field charts. Sometimes astronomers use planispheres or star finder charts which are magnified areas from star charts to find specific celestial objects, galaxies, and nebulae. 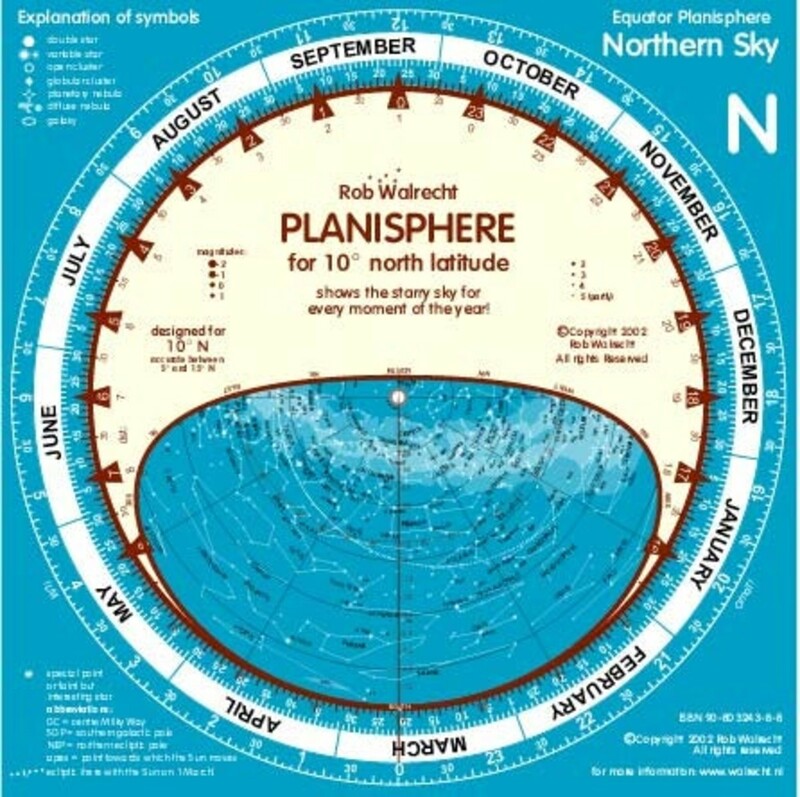 This one of many version of planisphere or star finder chart available on the market. Star finder chart with some of the largest stars in the galaxy. Before you can begin any star glazing, your eyes must be fully dark-adapted. When you are in a well lit place your pupils are constricted to let in less light but when you are in a dark room or out at night your pupils are dilated to allow more light to enter them. At full dark-adaption the pupils are 6 to 7 mm in diameter and it may take up to an hour for this to happen. However, you will be able to see light from more stars in as little as 10 minutes in the dark as your eyes approach full dark-adaptation. Once your eyes are dark-adapted they must be protected from bright white light. Therefore, any illumination needed at this point must be from a red light source since this wavelength has the least effect on the reflexive response of the pupils to light. Finally, before you can start discovering the wonders of the night sky you must understand how the locations of the planets, stars, nebulae and galaxies are determined. All objects in the night sky are set against a background called the celestial sphere. This sphere is basically an expansion of the reference points on the Earth’s surface such as the equator, the poles, the longitudes and latitude lines out into space. Another way of looking at the celestial sphere is imagine being inside a hollow, transparent earth standing at the center and looking out into space to see where the stars and other celestial objects line up with the coordinates on the Earth’s surface. The equator would become the celestial equator, the poles extended out would hit the position in space over them called the north and south celestial poles and the plane that is perpendicular or forms a right angle to the sun’s axis is called the ecliptic plane. This ecliptic plane forms a 23 degree angle with the celestial equator since the Earth is tilted 23 degrees on its axis. Distances on the celestial sphere are measured in angles, e.g. degrees, minutes and seconds of arc. On any given night at a specific time, you can locate any star, planet, comet etc. from a previous observation by knowing its coordinates despite the fact that every object in the night sky is in constant motion. The stars, however, are considered to be fixed, since their motions are very difficult to detect, even over periods of many years, because of their immense distances from us. But we do see different stars at different times of the year because of earth’s changing position along its orbit. This is due to the changing direction that the earth’s tilted axis is pointing with respect to the sun’s axis. 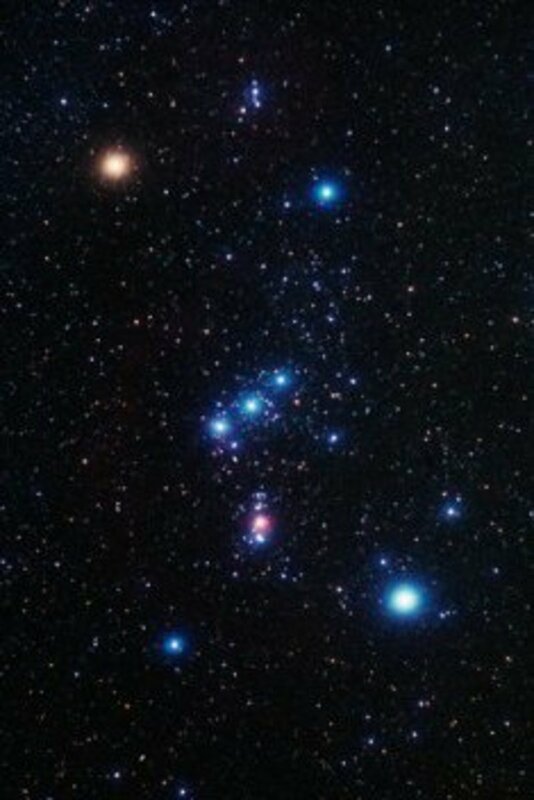 For example, observers in the northern hemisphere can see the Orion constellation in the winter months and observers in the southern hemisphere can see it in the summer months. 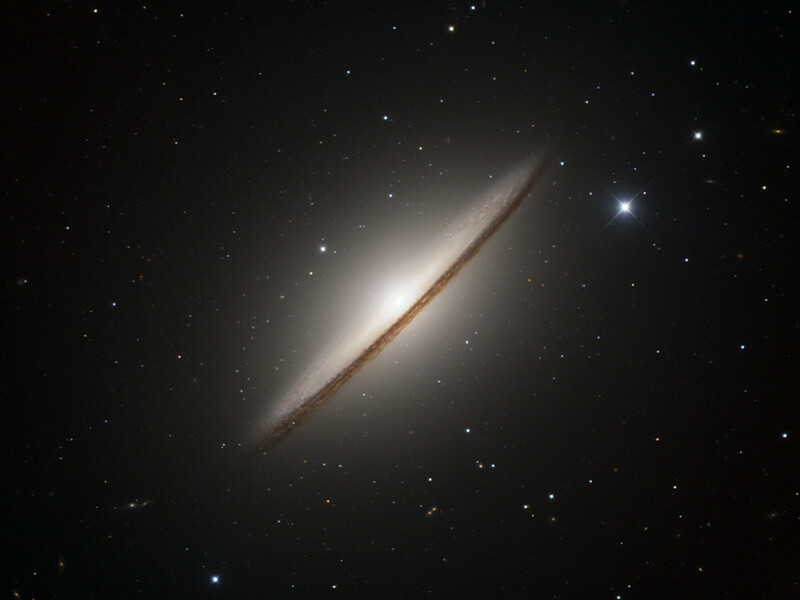 The Sombrero Galaxy, located 30 million light years away. Amateur astronomers use a method called star-hopping to find the location of many celestial objects in the night sky. This method is generally done with a pair of binoculars but sometime it can be done without optical aids. 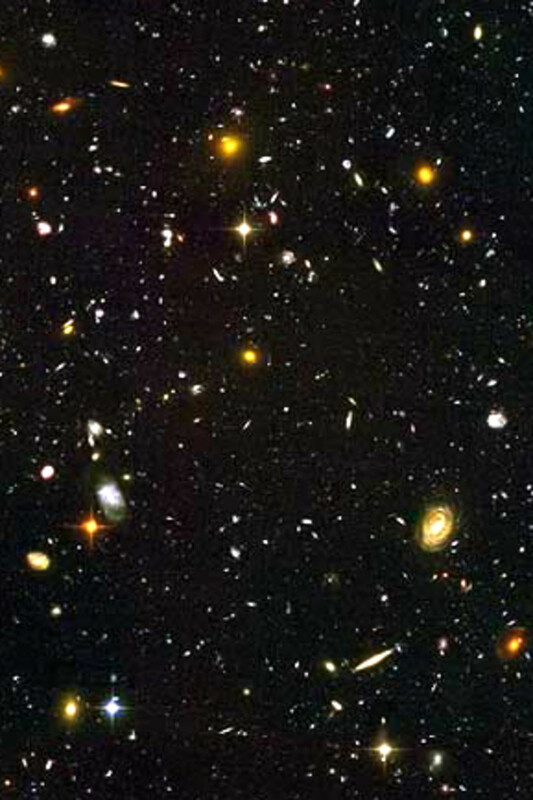 Astronomers usually start by first locating “guide stars” and then follow lines or patterns from these stars to locate other objects in the sky. Guide stars are generally bright and can be found on star charts accompanying many astronomy books. To use a star chart you first must identify the guide star or guide stars on the chart. Next bring one of the guide stars into the field of view of your binoculars or line it up with the cross-hairs in your view finder if you are searching telescopically. Now you can hop from one star to another until you find the celestial object being sought. Once the celestial object is found you can draw a broken line of the path you took on the star chart to find the object. This makes the search much quicker and easier the next time around if you wish to return to this object for further observations in the future. 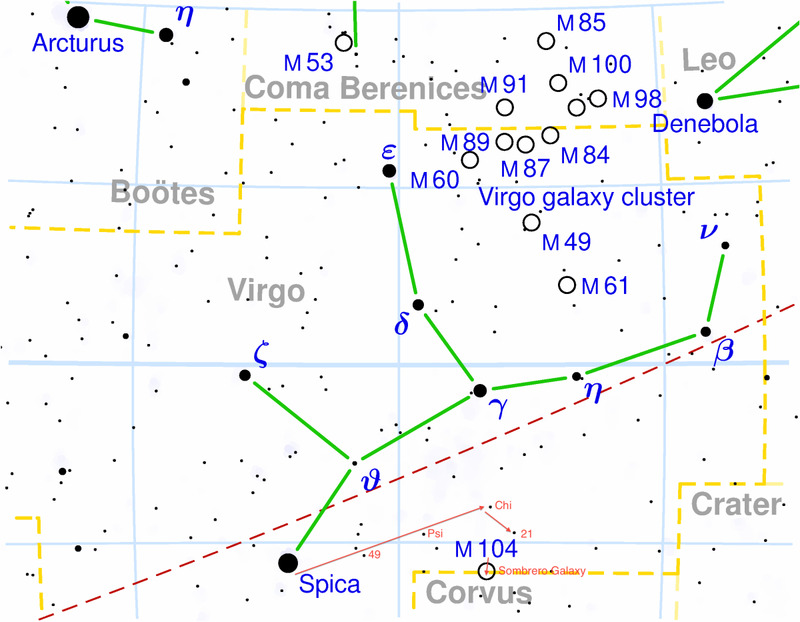 For example, to find the beautiful Sombrero Galaxy (M104) located near the constellation of Virgo we must start with a star finder chart, similar to the one below, containing the Virgo constellation. Next we need to identify the guide star or guide stars in the night sky based on the star pattern on the chart. They will be the bright stars in our field of view. On the chart there are four stars in a straight line starting from left with the brightest star in the constellation called Spica and moving across to the right are the other stars designated as 49, Psi, and Chi. Next we would see another bright star below and slightly to the right of Chi designated as 21. The Sombrero galaxy would be a bright fuzzy spot below and to the left of 21 as indicated on the star finder chart. A course you will not be able to see this galaxy as it is in the above photo unless you happen to have in your possession a very powerful telescope. However, you still would get the thrill of locating this and many other objects in the night sky without the aid of computer softwares. That is the beauty of star-hopping, finding these objects simply by knowing where to look. Star chart of Virgo constellation. Red arrows show visual movement from Spica to 21 and down to the location of Sombrero Galaxy, M104. Star-hopping can also be performed with the naked eyes by knowing some of the familiar constellations such as the Big Dipper, Little Dipper, or Orion to find stars like Arcturus, Spica, and Polaris (North Star). In the northern hemisphere, you can locate one of the brightest stars in the sky, Arcturus. First, you must look approximately in a northern direction toward the north pole and look for the Big Dipper (Plough) if you are in a location to see it above the horizon. There are three stars that make up the handle of the dipper. The three stars on the handle as you move away from the dipper along the handle are Mizar, Alcor, and Eta. To find Arcturus just extend the arc of the handle from Eta to the brightest star in the region. 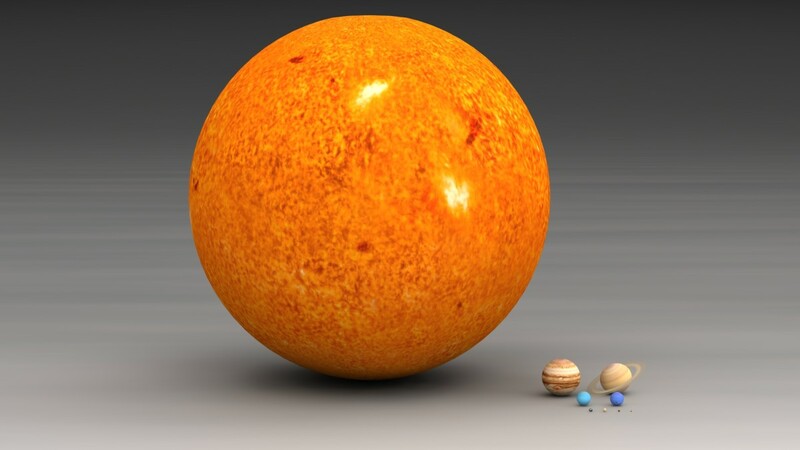 Arcturus is orange-yellow to the naked eye and is about 28 times larger than our Sun. It is about 37 light years away from Earth. 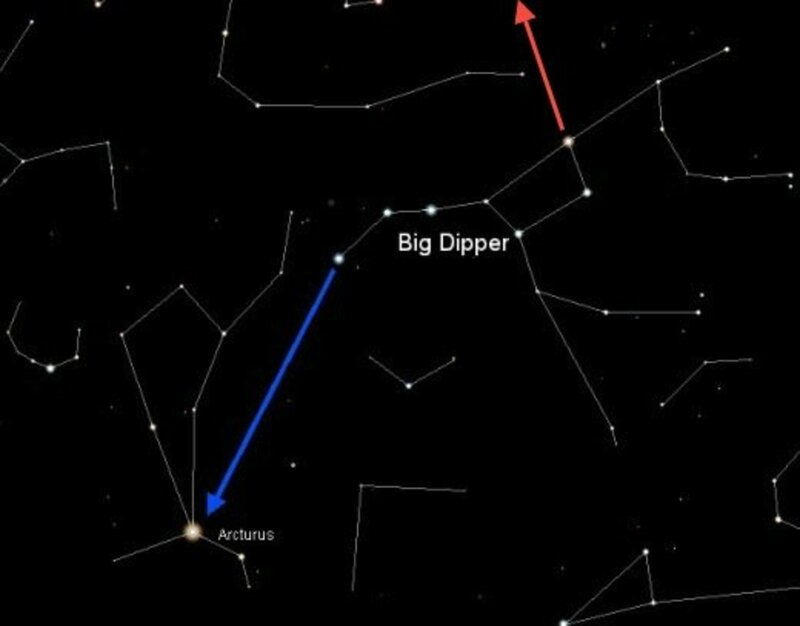 Location of Arcturus with respect to the Big Dipper. The red arrow is pointing toward Polaris, the North Star. 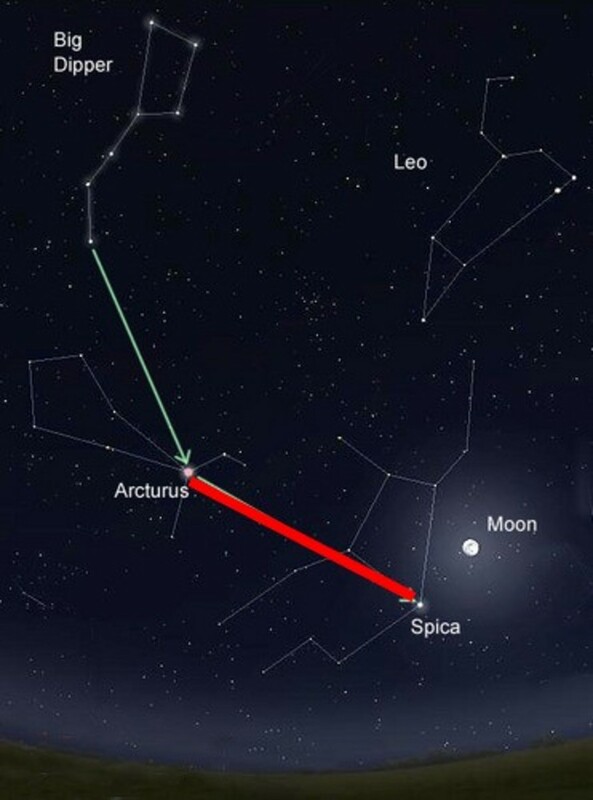 Once you have located Arcturus, Spica is easy to locate in the night sky. There is a saying in astronomy used to locate Arcturus and Spica: “Arc to Arcturus and spike to Spica”. The photo below shows the location of Spica with respect to Arcturus and the Big Dipper. Location of Spica with respect to Arcturus and the Big Dipper. 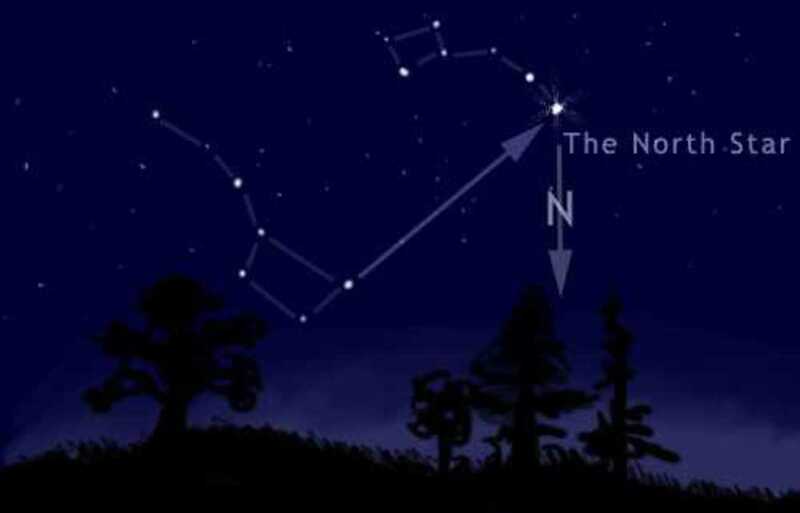 If you are ever lost at night in the northern hemisphere without star charts for the northern hemisphere and you are able to see the Big Dipper you can pinpoint the exact location of north. Just trace an arrow from the lip of the Big Dipper a bright star higher up; that is Polaris, the northern celestial pole well known as the “North Star”. Next all you have to do is drop a line straight down from that star to the Earth’s surface as illustrated in the photo below. North is in that direction. East would be right of that point and west would be left of that point. South is behind you. 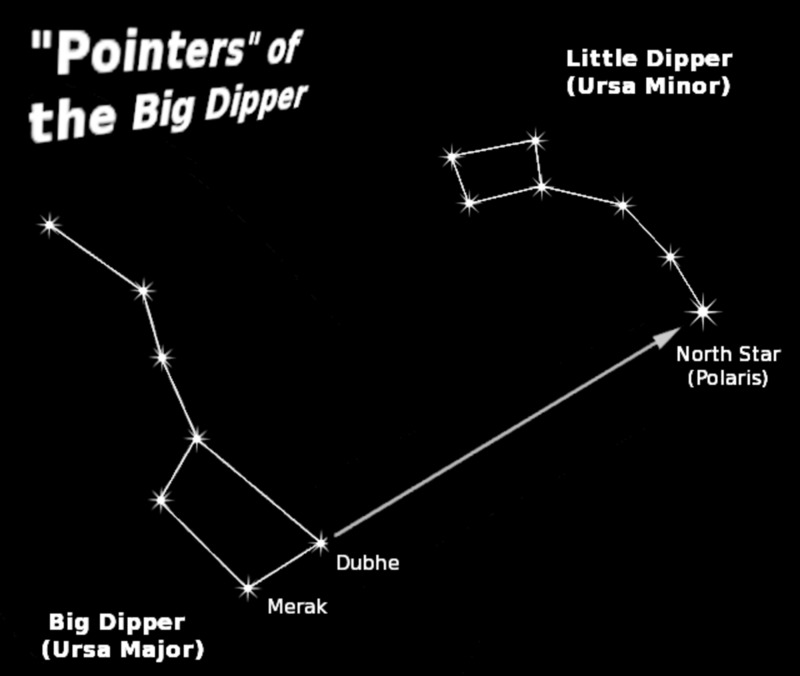 Using the Big Dipper to locate Polaris, the north star. The North Star is over the North pole on Earth. The axis of the North pole points to Polaris, the northern celestial pole. 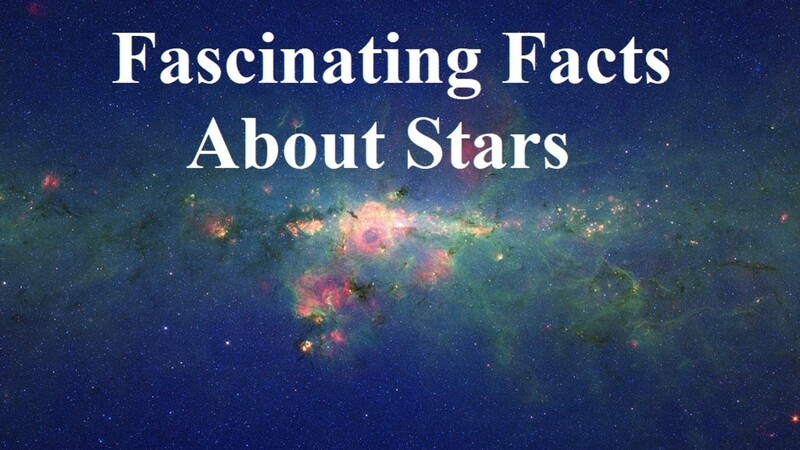 All the stars I mentioned so far are located generally in the northern hemisphere. However, there is one popular constellation located in the southern hemisphere that can be used to determine the south direction in that hemisphere. 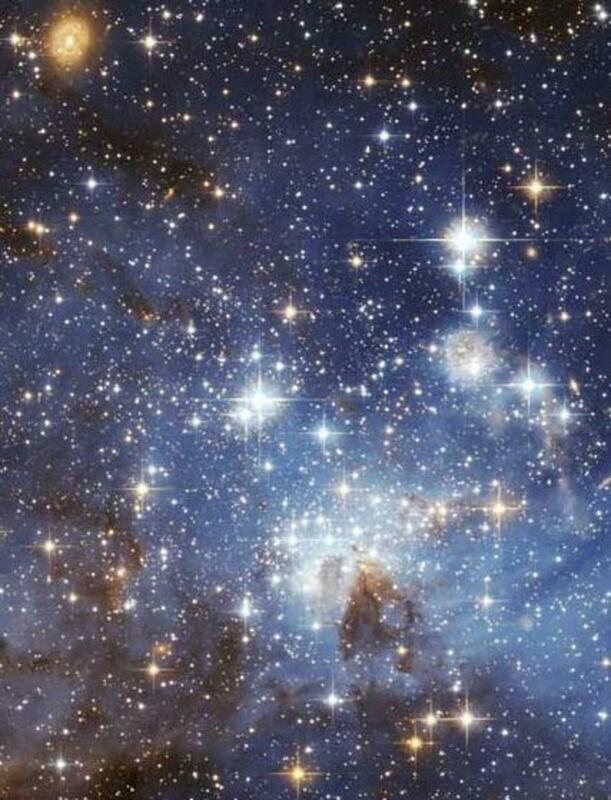 This constellation is the “Southern Cross” or Crux and it is the smallest constellation named by astronomers. This constellation is composed of five stars, one for each end on the cross and the fifth star is located to the lower right of the point where the lines cross each other. 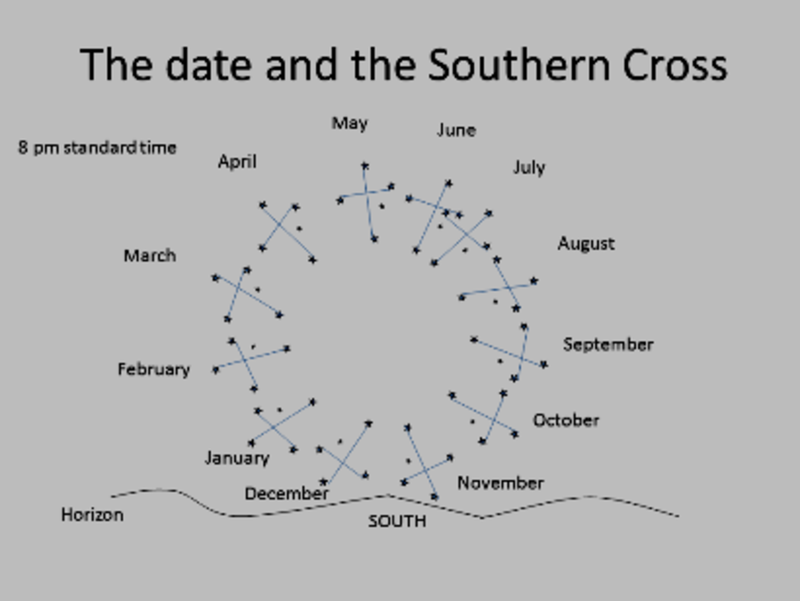 The circle made by the movement of the Crux in the night sky during the year. This circular movement is also made on 24 hour cycle. Finally, to find the Crux, look for two bright stars that always point to the shorter line of the cross as it make a complete rotation around a central point each day in the southern sky. The two stars are Alpha Centauri and Beta Centauri which are part of the larger constellation Centaurus and are the brightest stars in the constellation. The point at the center of the circle formed from the movement of the Crux is directly over south direction on the Earth’s surface. Looking in this direction east is left, west is right and north is behind you. As you can see, exploring the night sky using the old methods of finding celestial objects can be quite fun and rewarding with the sense that you can find many of these stars by just using charts instead of computers. 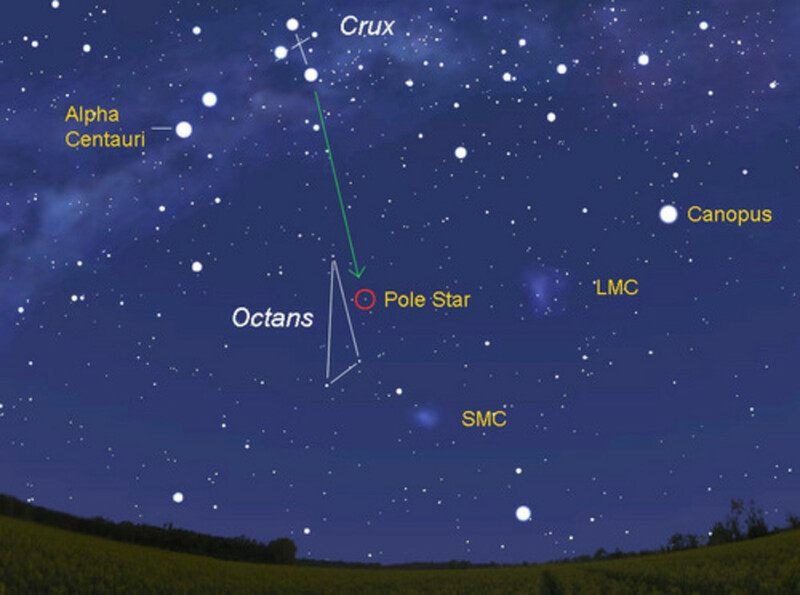 The pointer from the Crux points to the southern celestial pole or star called Sigma Octantis. This star is not as bright as Polaris, the North Star. Mklow1, thanks for your comment and for stopping by to read my hub. This is a great and informative article. I look forward to reading others. Cclitgirl. thanks for your comment. I really enjoy exploring the night sky more when I am using sky charts. They are much more convenient to carry around than telescopes. This is a great hub! I love looking at the night sky. You've covered how to find the main stars in great detail and I definitely "star hop" to find my stars. When I go to the beach, I always bring a star chart because depending on where you go, you can get a really great glimpse of the sky, as long as there isn't much light pollution.